I have been making Real Silk strings for Lyre and Guitar for several years. My very favorite instrument, however, has been Guqin, one of the oldest known stringed instruments. The requirements for Guqin strings are much more exacting than any other instrument, too. They are commonly stroked and pressed against the surface to produce a sliding tone, so they must be very smooth and exceptionally hard. With the experience and feedback from satisfied users of my Lyre and Guitar strings, I have developed strings of length and smoothness that are now on a par with strings made before the Cultural Revolution in China. The Cultural Revolution nearly caused the extinction of this wonderful old instrument. The craft of making Silk Strings was, for a time, lost and Nylon was used instead. Now there are possibly 3 Silk string makers including myself in the world. I like to de-emphasize the elitist trend that seemed to make it appear necessary for the Chinese Cultural police to force the Literati tradition underground. An unfortunate effect of exclusivity is that it often manages to isolate Taoist practices from the common population. I personally consider it a misreading of the Tao Te Ching to raise the Cultural standing of gifted individuals to such a level that persons in support roles are undervalued. The Old Man (Lao Tzu) never denigrated the average person. To the contrary, he recognized frequently in attributed quotations that it is indeed the day-to-day activity of steady labor that raises a culture to sustainability. Silk has been preferred for centuries in heirloom or reproduction instruments, especially appropriate in Asian and Tribal music for which loudness isn’t the important thing, but rather, rich harmonics. 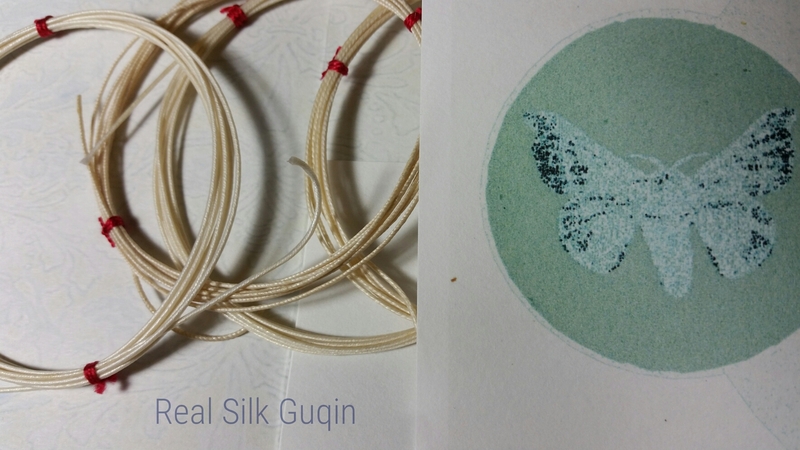 I have been making Silk Strings for several years, and have perfected my way of working with silk, based on Japanese and Chinese methods. As far as I know, I am the only one that makes silk strings that are available for purchase outside those countries. Instrument makers and ethnic musical instrument enthusiasts have expressed a strong interest in my work with silk. In order to make it easier to choose a size I am posting the string sizes separately. Keep in mind, too, that I can create custom diameters specifically for your instrument. My process owes a debt of gratitude to the notes of Alexander Raykov, who pioneered many methods that I have distilled to what I believe to be the best blend of what I have learned. 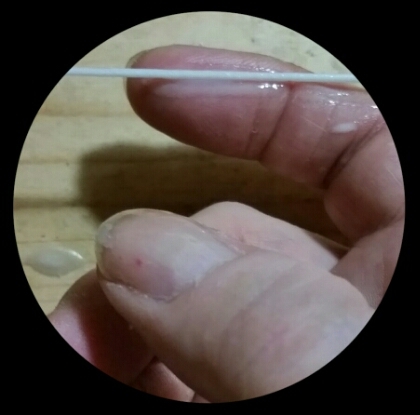 After spinning the plies to the correct twist I harden them with a special vegetable based glue, I then treat the string with a proprietary resin formula that is unique to my work. My resin formula is a combination of beeswax, shellac, Copal, and other plant-based poly-resins. These are all-natural and renewable materials that I have used in different combinations for many years. Real Silk strings are kinder to your fingertips, and are easier to press against a fretboard. Real Silk strings are unusually resilient and do provide richer reverberations; a crisp pluck and harmonically rich finish. Real Silk will give your vintage or traditional instrument a whole new voice of distinction and complexity. New Real Silk strings do require several days of tension and frequent re-tuning at first. After 3 or 4 days the strings will stabilize and hold tuning better than gut strings, either real or simulated. You should bring up the tension of any new strings slowly over several hours with sensitivity to whether it is within an approximate 1/3 of their breaking point –(a point at which the string begins to sound more like a metal string!) Yes, if you tighten a string beyond a certain point it will break. Use discretion. Strings will slacken over several days and stabilize to your local humidity. I like to keep a hygrometer close to my instrument to observe objectively the changes over time. Each string comes over 92″ long; this is enough to re-tie the string as the first 6 to 8″ wear. The average lifespan of a good silk string can be 7 to 10 years if properly maintained. A stable environment for your instrument will be stable for the strings. Order a Custom Gauge and length for your particular needs. This may take up to two weeks to produce. Look at my Intro page on my website for the most concise and detailed public information.